We love to visit museum every time we travel with our Kiddos. 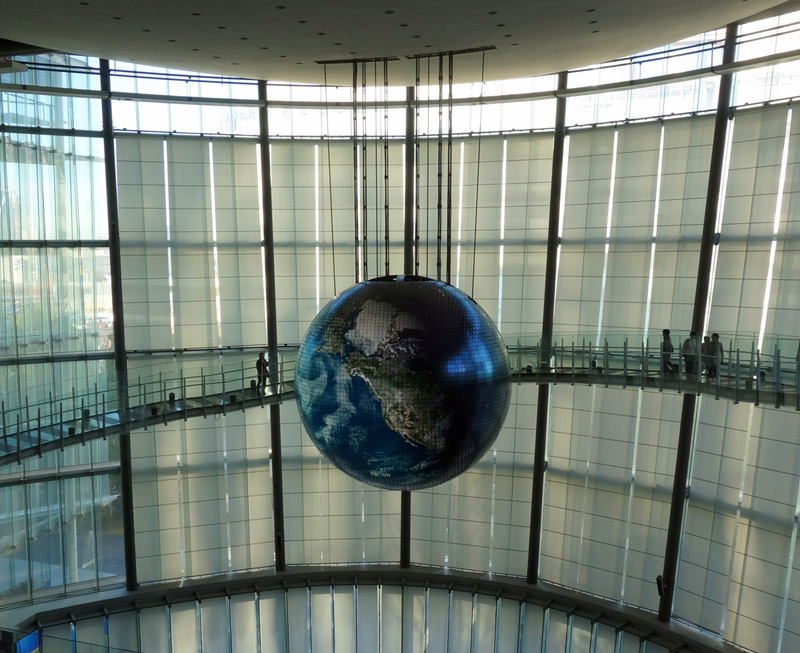 When I was making our itinerary to visit Tokyo, two museums came across our plan: 1) Miraikan:The National Museum of Emerging Science and Innovation, and 2) The National Museum of Nature and Science. The later has a huge dinosaurus, perfect if your kids love the dino. Unfortunately museums in Japan are closed from 28 December until beginning of January for the New Years holiday. 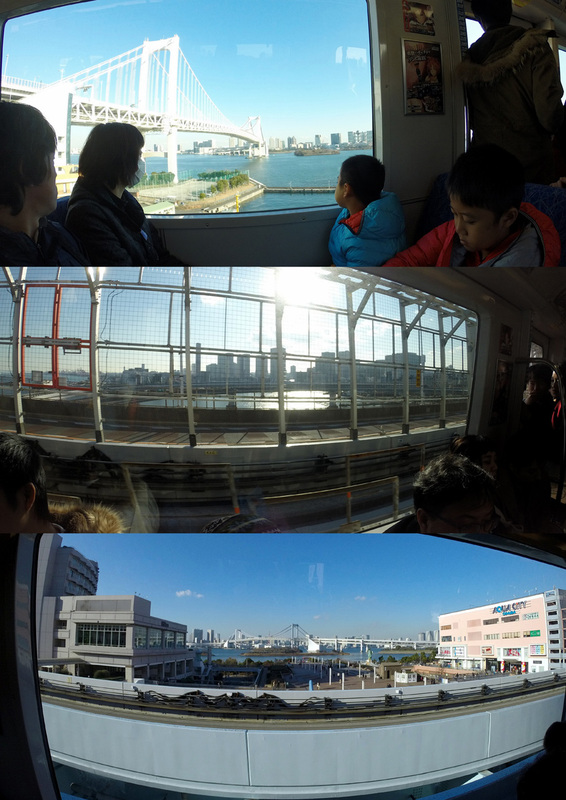 So we had only one day on 26 December to visit museum in Tokyo. And we had to choose which one to visit between the above mentioned museums. Our Kiddos#1 happy face, just to see Asimo's picture! Miraikan, The National Museum of Emerging Science and Innovation is located at Odaiba, just few minutes walking distance from the famous Gundam statue. The closest train station is Telecom Center. 1. Go to Shimbashi Station. 2. Exit the station and walk to Yurikamome line. 3. Purchase the train ticket. Please see this link for the fares. 4. 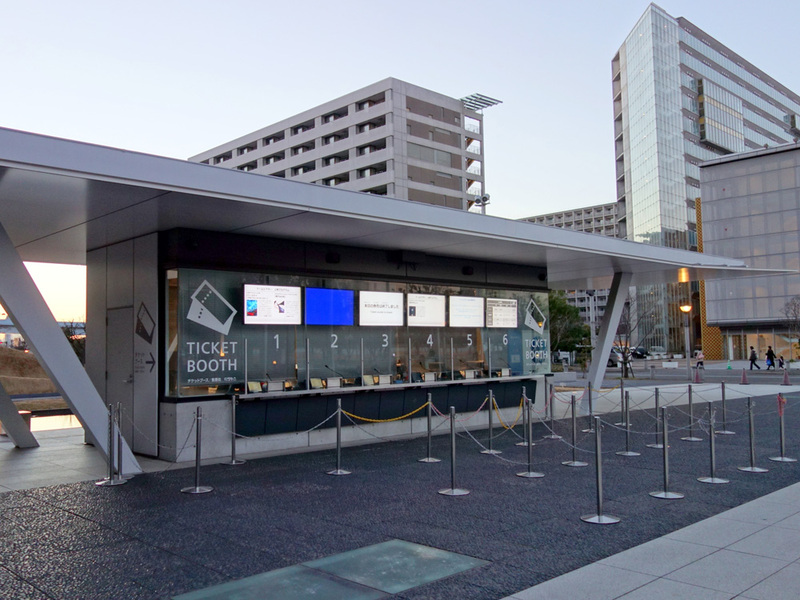 Take the train to Telecom Center Station. After you reach Telecom Center Station, walk to the sign heading to Miraikan. 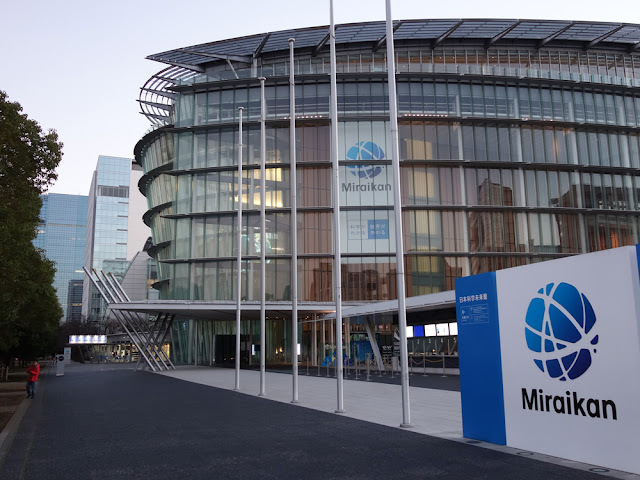 And within 5 minutes, you will reach the entrance and the ticket booth to Miraikan. 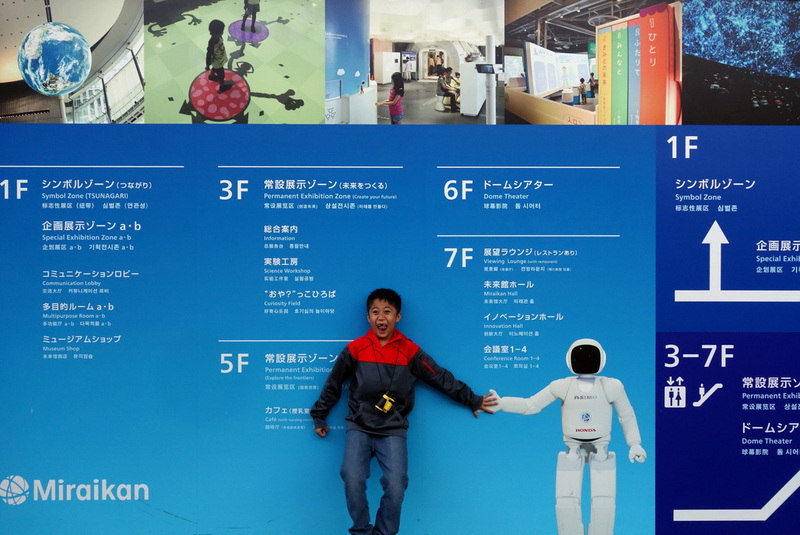 As we got complimentary tickets for the whole family from Miraikan to visit their permanent exhibitions, we went directly inside and went to the 3rd floor. 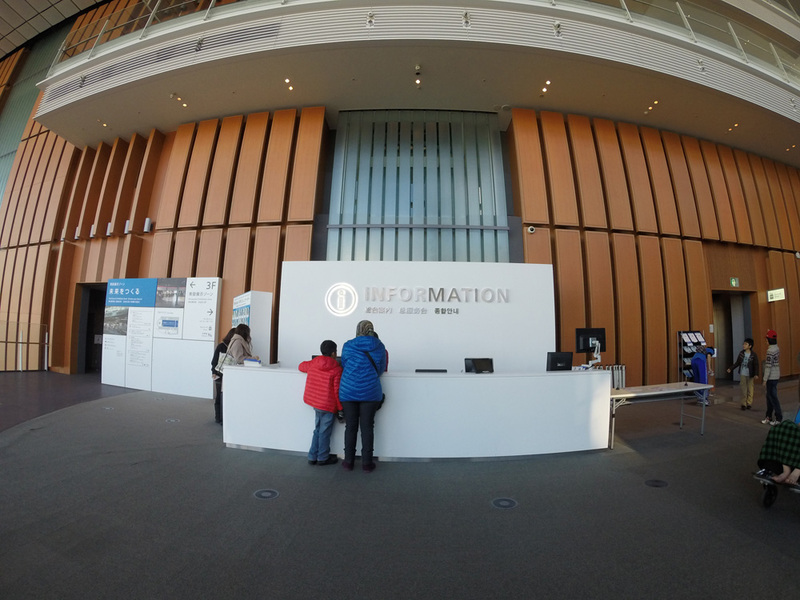 We were required to take our tickets at the Information Counter. The ticket is JPY620 for adults and JPY210 for children. If you visit Miraikan on Saturday, the tickets for children under 18 are free. Please refer to this link for information about the tickets and discounts for groups. We started exploring Miraikan from the 3rd level, there was a ticket checking when we entered the exhibition room. 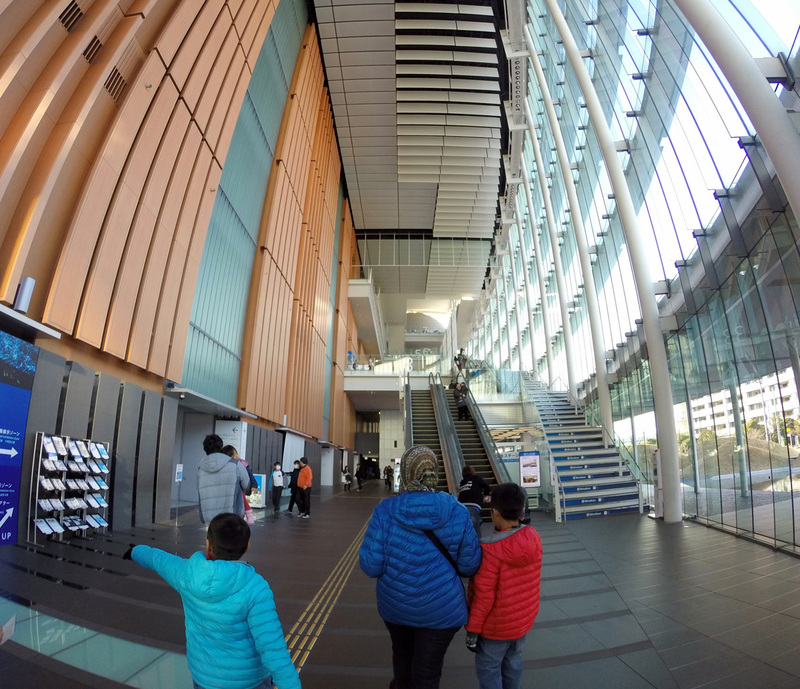 To the left from the entrance, we found a beautiful Japanese lady sitting on a sofa, watching Miraikan's visitors. 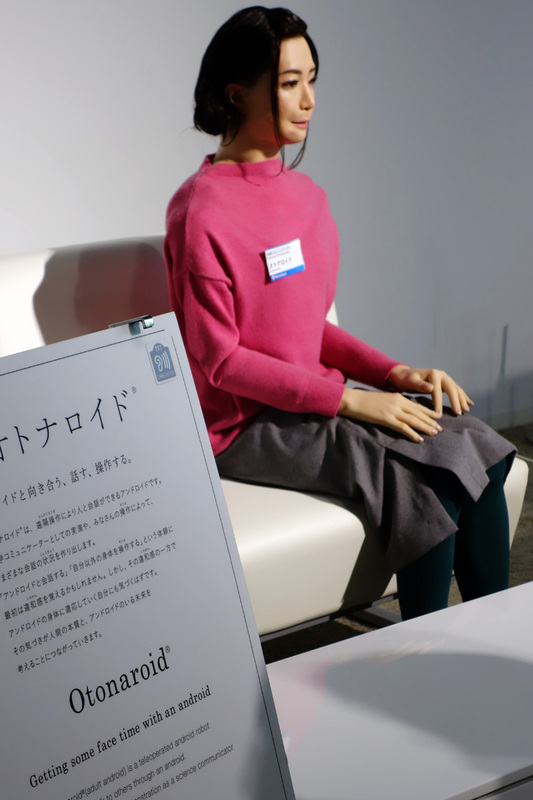 She is an Otonaroid, a teleoperated android robot. She could blink, breath, and I could see the change of her facial expression. She looks so real! 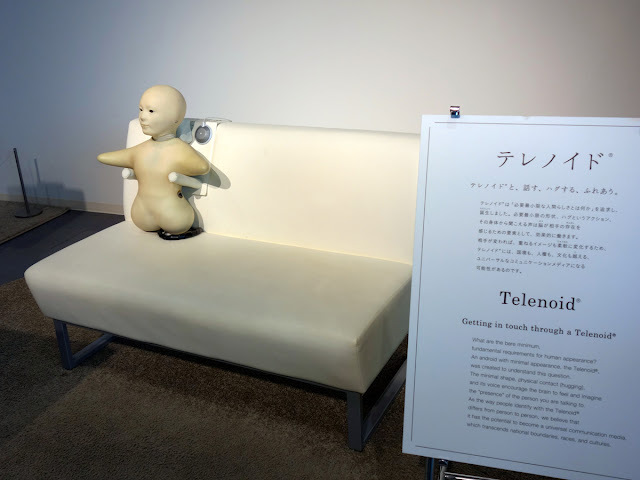 Another android robot we found was the Telenoid, a teleoperated android robot with a minimal design. Telenoid is made as an attempt to embody the minimum physical requirements for humanlike communication. Would you like to sit beside the Telenoid? 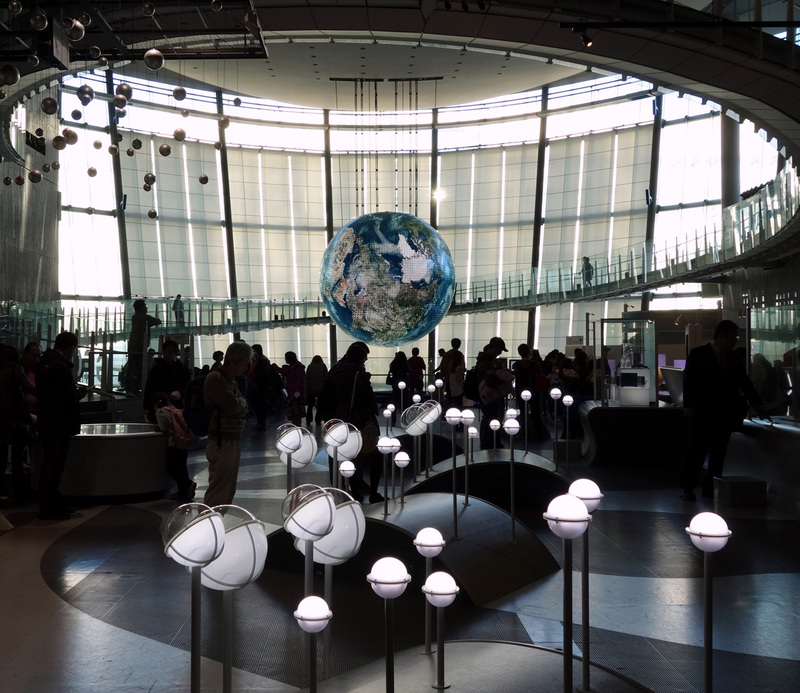 When I was searching about Miraikan, frankly speaking "the WOW factor" beside Asimo Robot, was this globe made from LED. 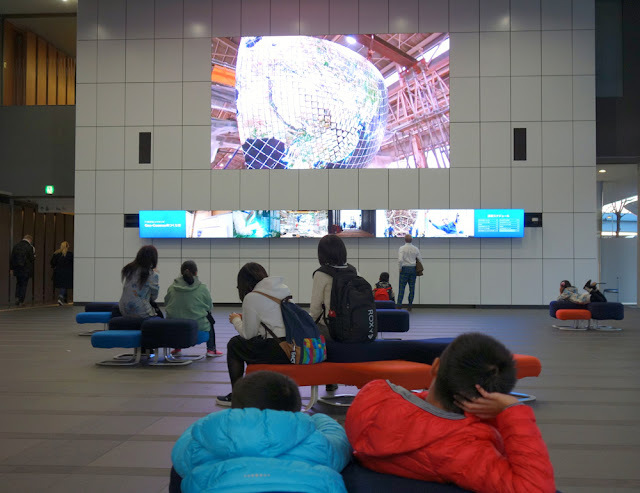 It is said to be the first "Globe-like display" in the world using organic LED panels. 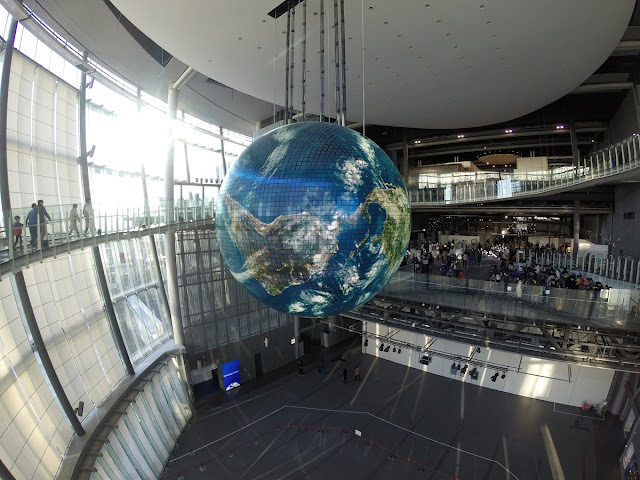 This globe was created from Miraikan's Chief Executive Director Mamoru Mohri, whose desire "to share with people how earth looks like from the space". So I posted some pictures of the globe from different angles, to show you how the earth may look like from the space. A family picture with this globe at the moment is the profile picture for our twitter and instagram @tesyasblog. 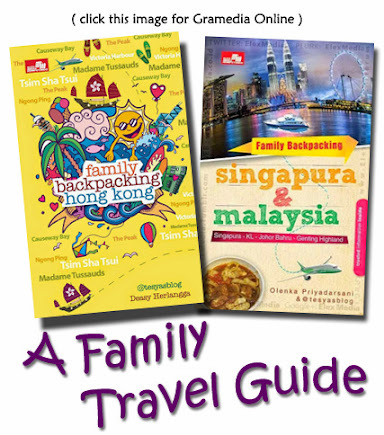 We hope that our family could visit many places as we had seen in the globe. 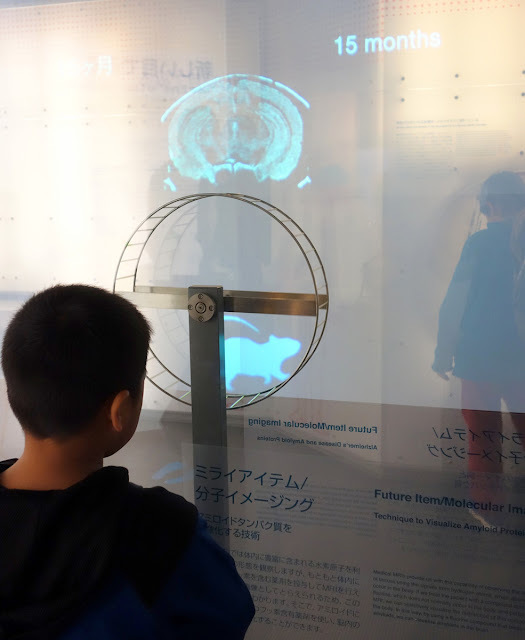 Beside the Tsunagari, on level three we also enjoyed some futuristic exhibition. In this area, we were taught that "wishes" can come true if we have "creativity". 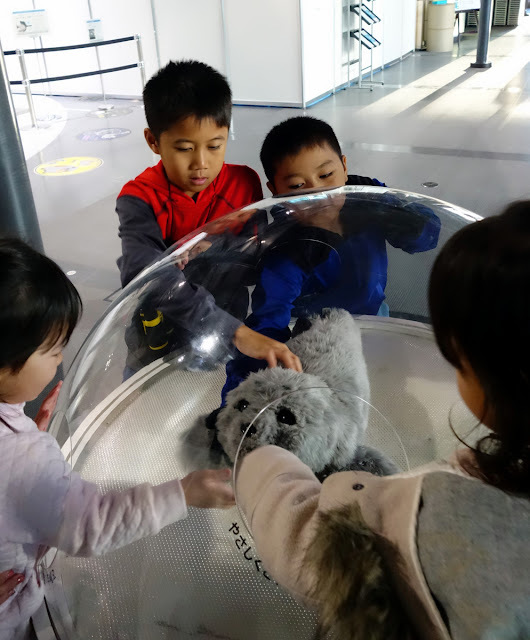 This pet robot was one of our Kiddos#1 wish. He had just lost his cat named Maxy before we went to Japan. So when he saw this pet robot, he was really interested and even said, "If we have this pet robot, it will never die like Maxy!" After exploring the 3d floor, we went to the 5h floor through the hanging bridge. On the 5th floor, we learned the construction of the world around us. I will not post everything we saw on this floor, but I will share with you some of our favourite things. 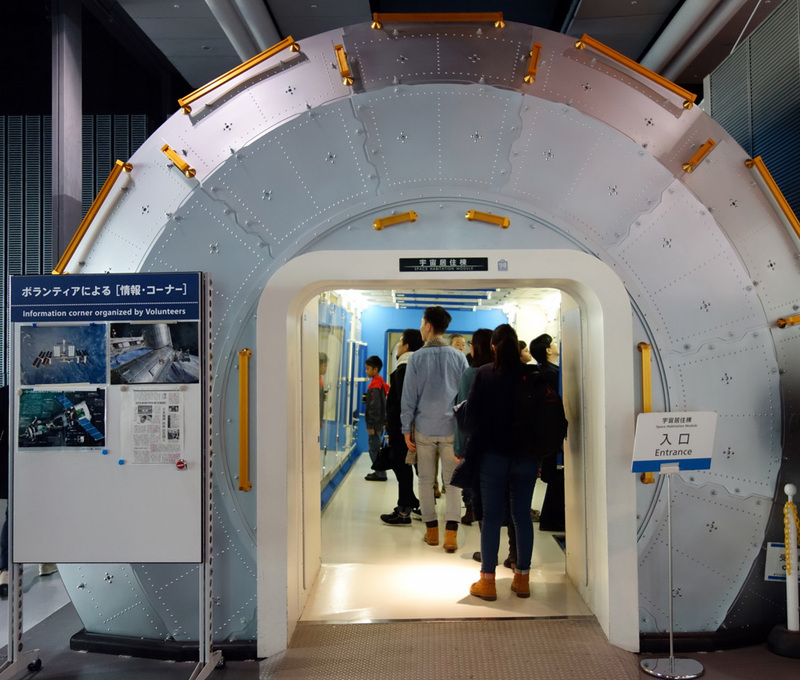 The first object we saw was a space tunnel, which was the International Space Station (ISS). Inside we learned how it feels to live inside an ISS. Would you like to live inside an ISS? This section is the most crowded one, with a long queue to enter the exhibition area. 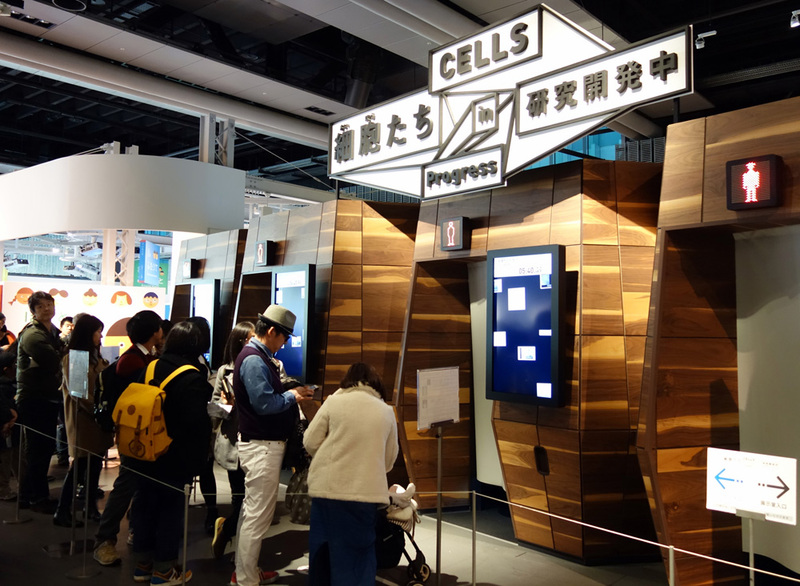 Visitors are taught about a wide range of ongoing studies about cells engineering technology. With the advanced of medical imaging devices, the technology to to look deep inside the body has increased significantly. And the technology is not only being used for humans, but also for a hamster. There were still many things we saw on the 5th floor, you have to visit this museum by yourself. 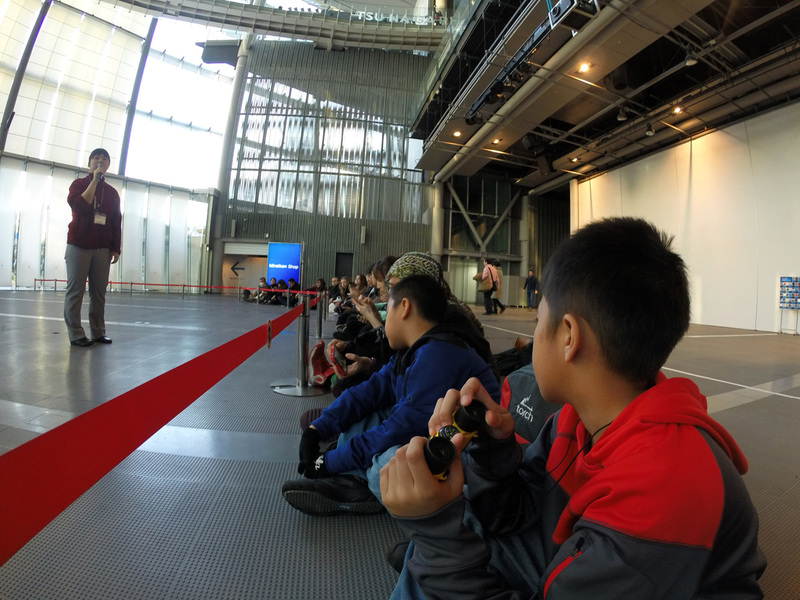 The show is conducted 4 times daily, we were lucky that we could see Asimo's demonstration at Miraikan at 4 pm (it was the last show). We were ready by the venue 30 minutes before the show, to sit on the best spot to see Asimo. Asimo exit from its house on time, and everyone really enjoyed how this robot could run, dance and sing. I posted a video how Asimo sing on IG @tesyasblog. Please have a look using hashtag #JPFamTrip. 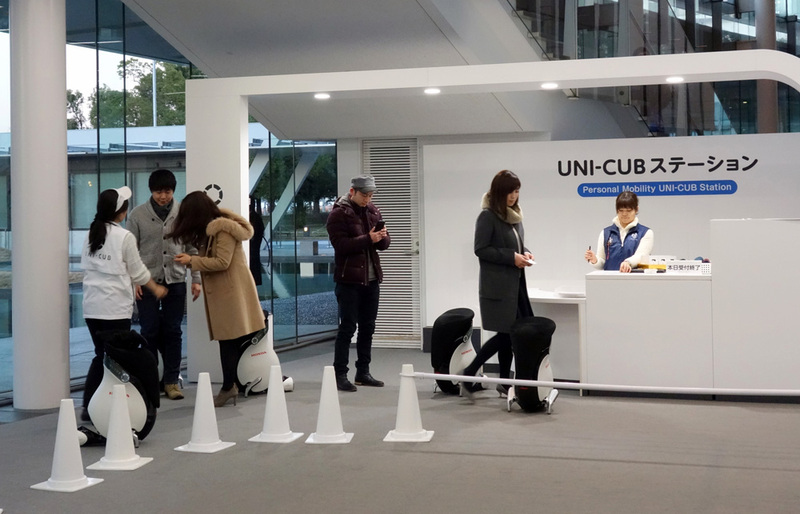 This museum really impress us with its building, the interactive exhibition, and also when we saw people riding "Uni Cub" around the museum. Too bad the counter was already closed when we wanted to buy a ticket for a quick ride. We saw a group of people using the Uni Cub entering the first floor. Next to the Uni Cub, we found a place to take some rest while watching the video. So we stopped for a while to recover our energy. 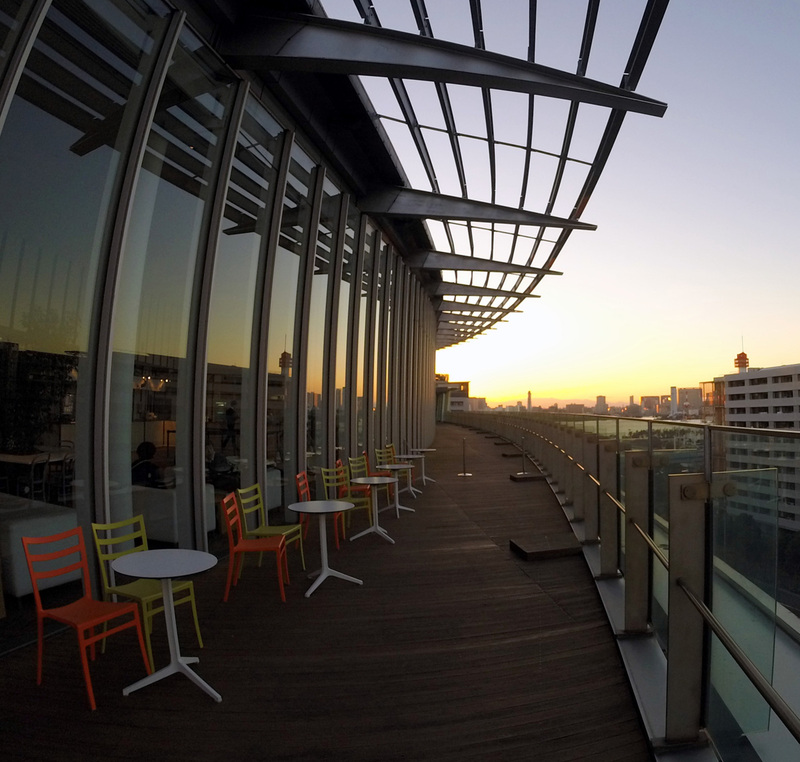 It was time to leave Miraikan, but of course we would not miss the opportunity to see the sunset from Miraikan's rooftop area. 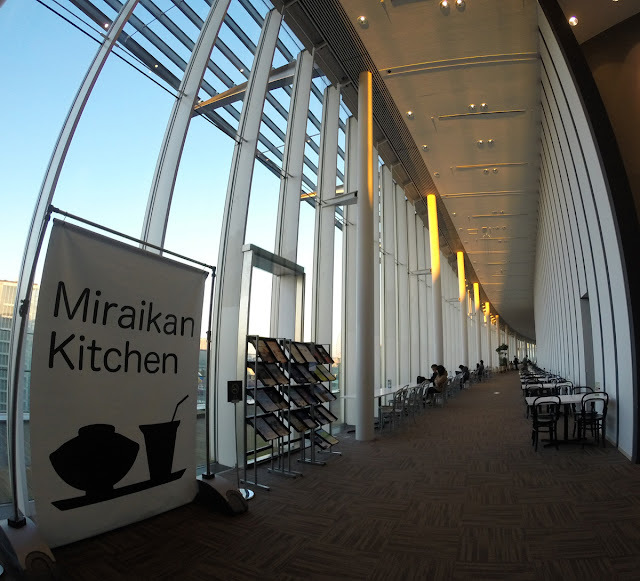 We didn't buy anything from Miraikan Kitchen, however we were allowed to went outside Miraikan Kitchen and enjoy the beautiful sunset. 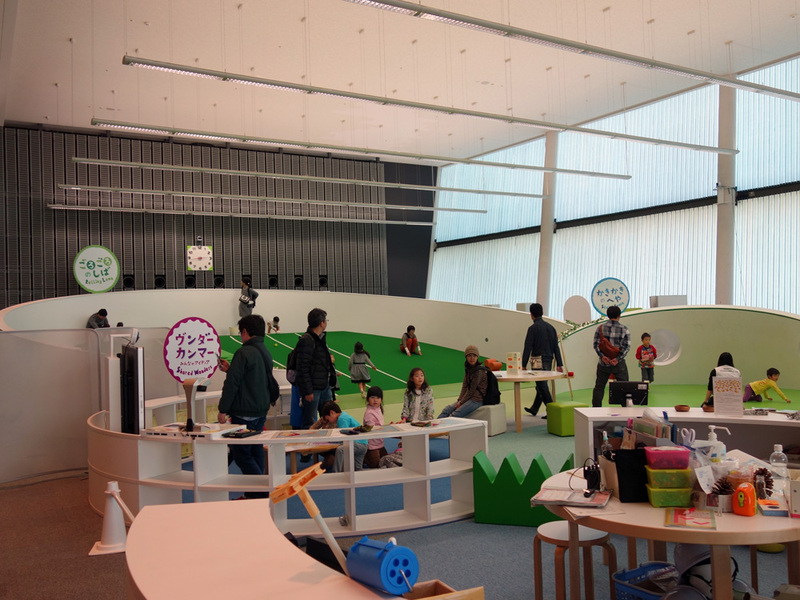 Is There Any Playground For Toddlers at The Museum? Yup, there is a playground on the 3rd level, near the Information Center. The reason to visit Odaiba is not only the Gundam statue, you have to consider visiting this super amazing museum if you plan visiting Odaiba with kids. If you think visiting Tokyo Disneyland is a must, I would say the same for Miraikan. 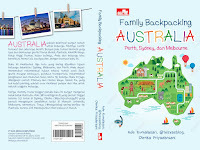 This is a place where you and the kids will learn lots of things in a fun way. 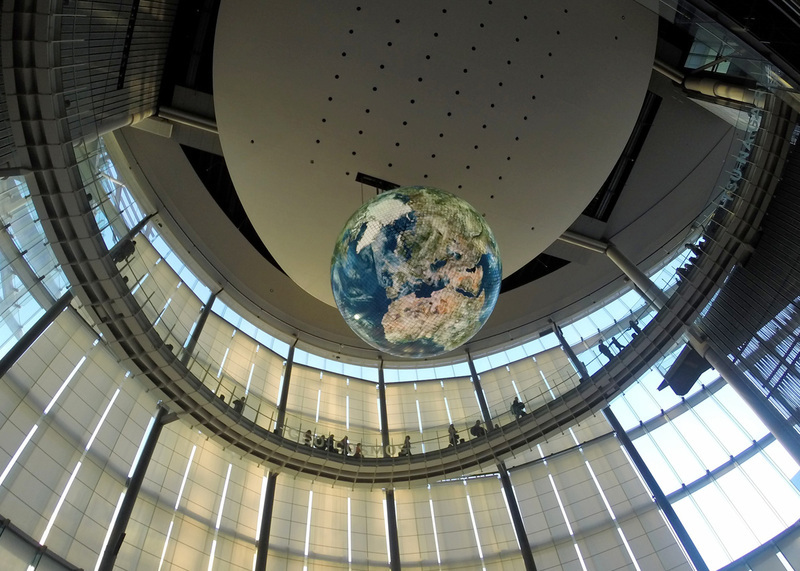 Yes, Miraikan is a FUNTASTIC place to visit. 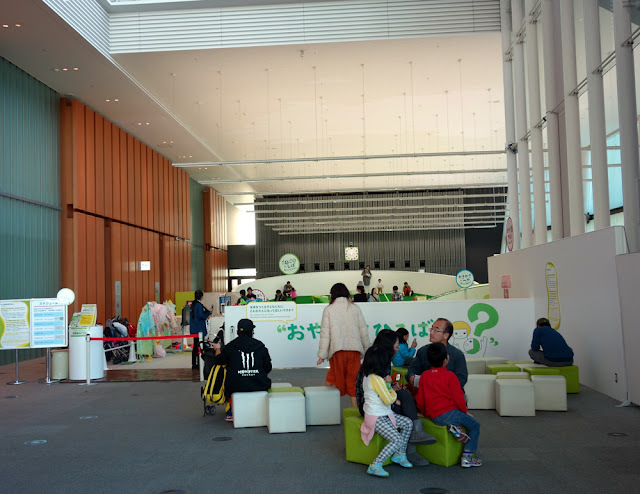 We got complimentary tickets from Miraikan to visit this museum, however the opinions written here are based on our own experience. Msh2n bs dpt rezeki kyk gini juga. Hai Mba, thank you udah mampir. 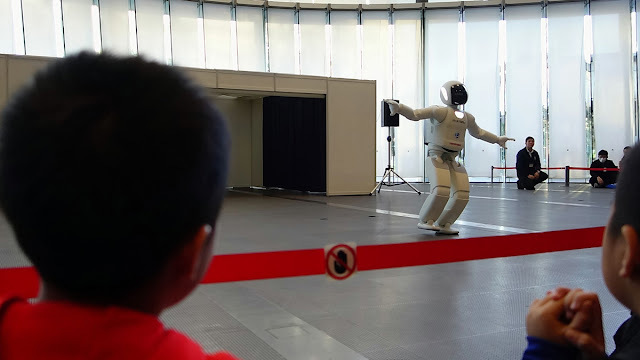 Iya anak-anak happy banget terutama pas nonton Asimo. Aamiin, mudah2an Mba juga bisa berkunjung kesini ya. I can feel the excitement when Bundo & Fam visited the museum😁 Kereen yah! 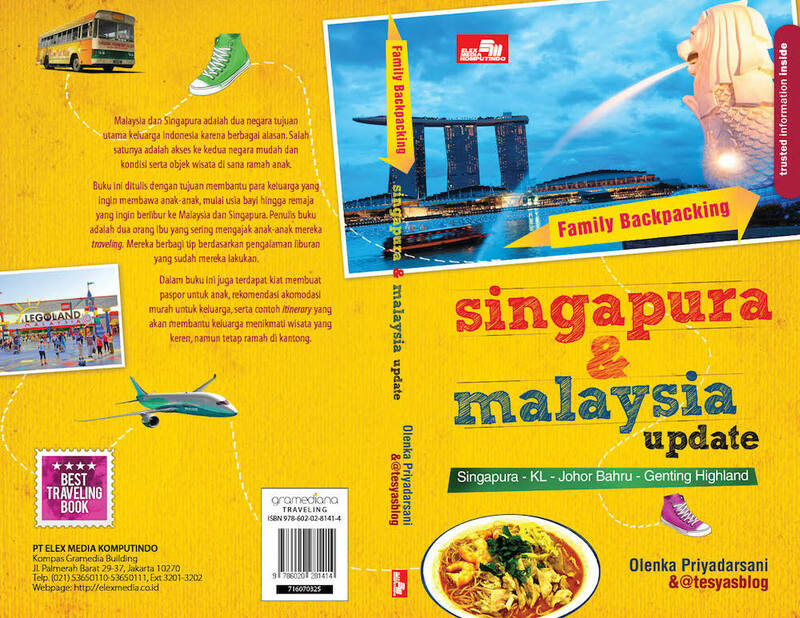 I also feel the excitement when you share to the us, your readers...thanks for sharing Bu Tes...keep travelling.. Yes Mar, this museun is really worth a visit. Nanti bawa Nolan kesini ya Mar. I hope I can be that lucky, too. Yes this museum is super awesome. I hope that someday you can also visit this museum ya Mba. 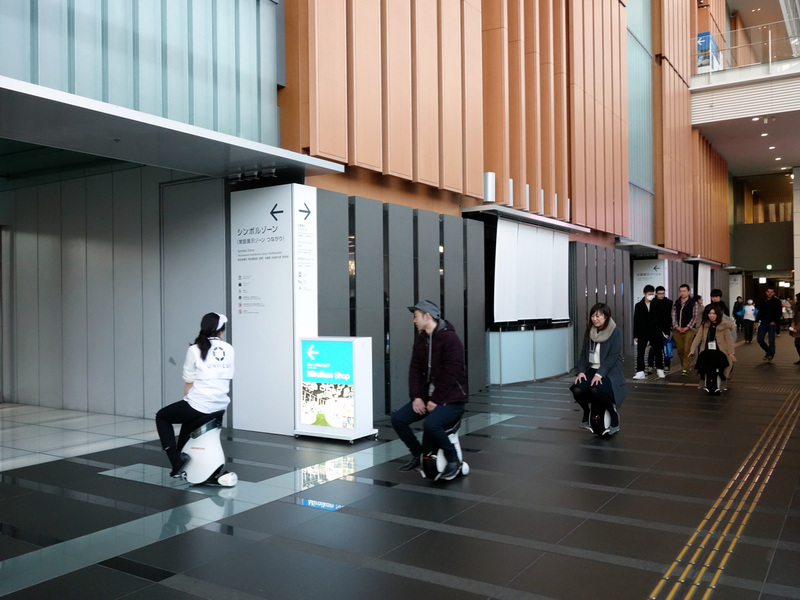 Yes, you should put this museum in your Japan's itinerary. Semoga nanti bisa kembali lagi sama baby nya ya. Wow! This must be one big museum! Yes Om Timo, this one is huge and really sophisticated. 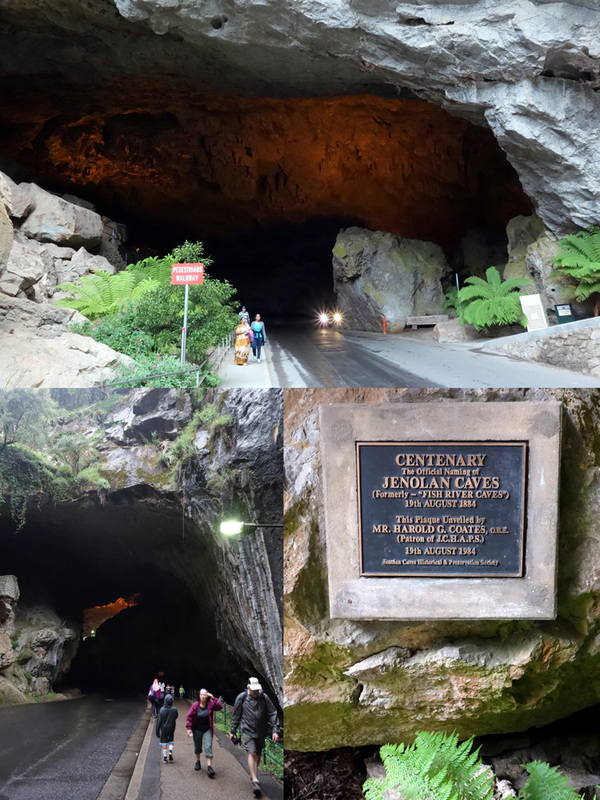 disneyland justru ga ada dalam itin ku ke jepang nanti mba :D.. ga tertarik samasekali.. ga ada wahana extreme juga toh di sana ;p.. Mndingan museum lah.. dan museum ini bkin speechless deh.. kerennya udh kebangetan.. pas anakku aku ksh tunjuk ini, dan dia liat Asimo, reaksinya cuma 1, "Mammyyyyy, aku mw liat Asimooo" hahahaha.. jd nambah 1 kayaknya list tempat di itin. Hahahah thank you for showing this post to your kids! Pasti akan enjoy banget di Miraikan, Fan! I wish I had more time here. 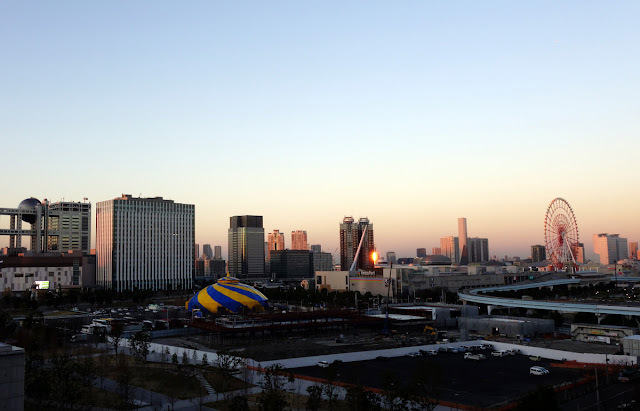 Fuji Q Land itu buka sih maksudnya? Atau kalau mau ke Yokohama untuk naik roller coaster Fan! Iyaaaa Mei, keren banget deh. Lebih keren dari Australian National Maritime Museum (ANMM), padahal so far ANMM itu museum terkeren menurutku hehe..
Iya Winny, bener-bener mirip lagi ya..